Crystal Mall, for those of you that haven’t been there, is a circular two-level Asian shopping center in Burnaby. On its street-level perimeter and on its inner concourse, are a plethora of small (some very good) restaurants. On the upper level is the mall’s food court, a wonderland of various Asian food stalls. 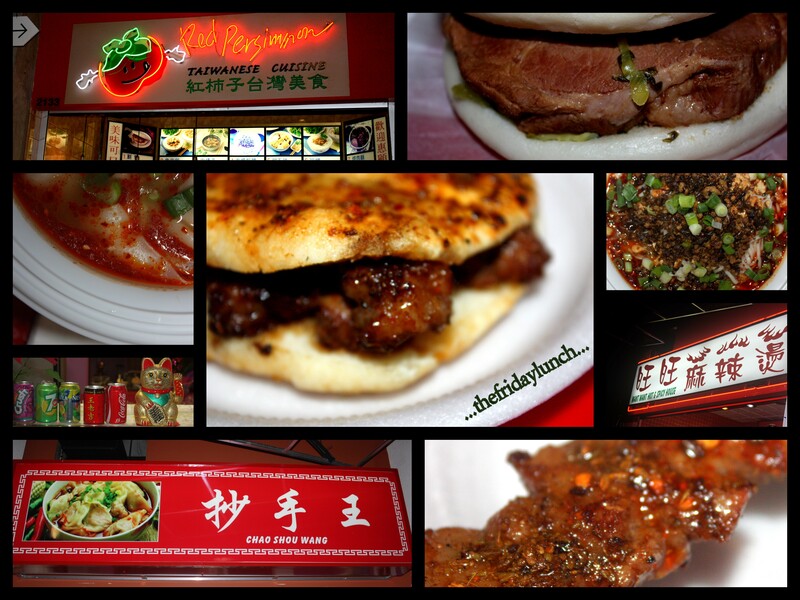 They are all primarily Chinese-run and most offer Chinese fare. There is a smattering of Japanese and one that serves up Thai and Malaysian. All told, there’s about thirty vendors to pick from…they run the gamut from so-so to darn impressive. When lunchtime rolls around and I’m not 100% sure what I’m hungry for, I head to the food court and start grazing. 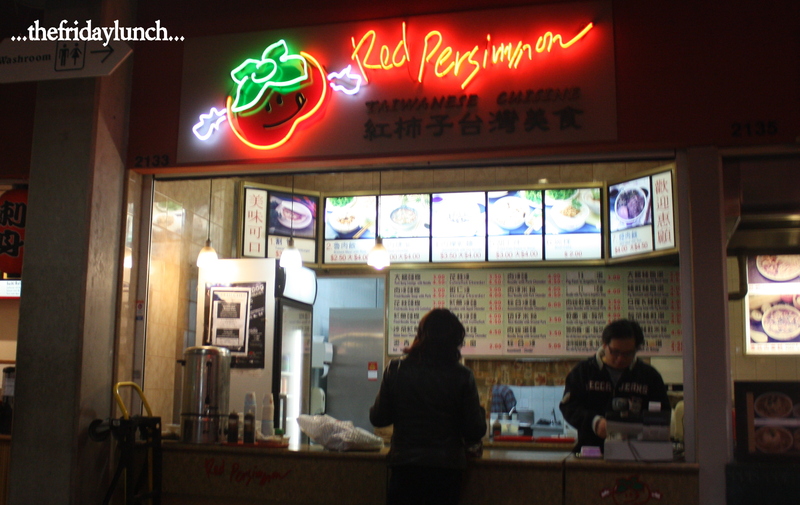 Today’s first stop is Red Persimmon Taiwanese Cuisine for their Gua Bao (刮包) aka the Taiwanese Burger. This pick was due to a tip from Kim from I’m Only Here For The Food. It doesn’t look like much…kinda boring actually. But that’s far from true. 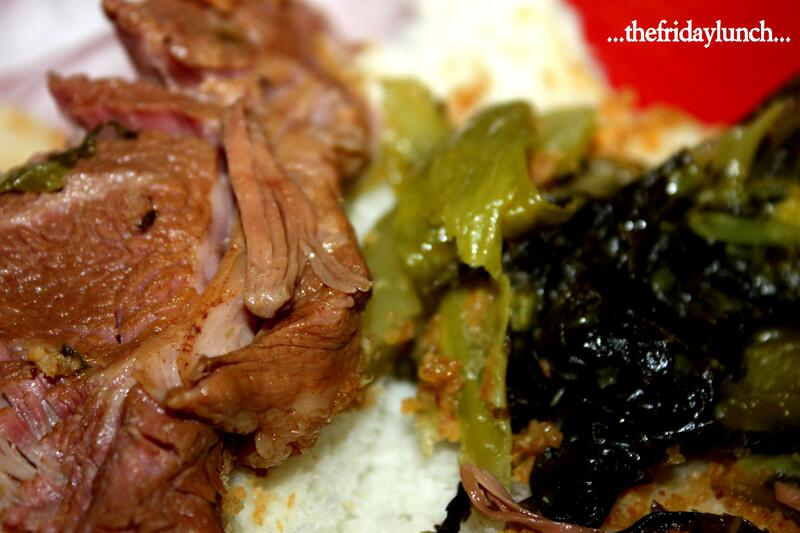 The big chunk of pork has been braised a good looong while…very tender, very moist. The massive, pillowy steam bun has nice chew, slathered with sugary peanut powder and crunchy pickled greens. Excellent value at $3.50. After perusing around the net awhile, I came across this mouth-watering post from eatingclubvancouver as well as a great recipe page from nibbledish. Seems most recipes call for cilantro. That particular fresh herb would have livened things up nicely. Another great tip was from Ben at Chowtimes. 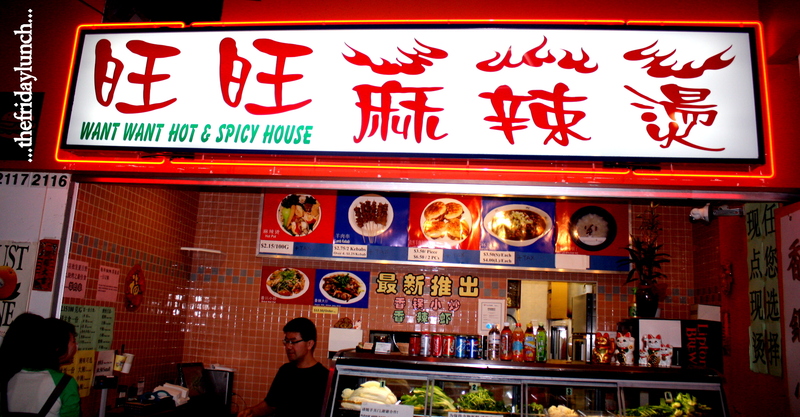 He wrote about Want Want Hot & Spicy House and another Asian-style burger. The menu simply states it as “Lamb Patty“. It should be called “Spicy Cumin Lamb in Spice-Coated Pocket of Deliciousness“! A terrific little sandwich. Despite its size (about the same as an Egg McMuffin) it carries a lot of weight…and obviously, a whack of flavor. 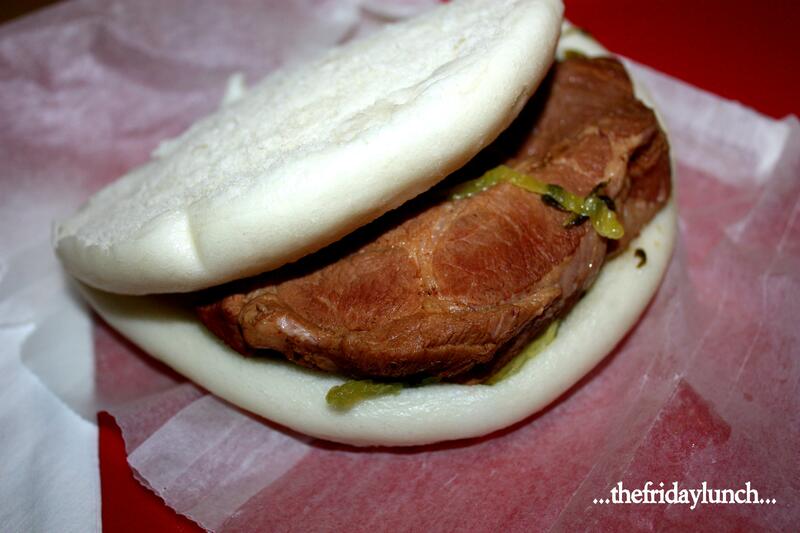 When the bun is seasoned as heavily as its ingredients, you’ve entered flavor country. 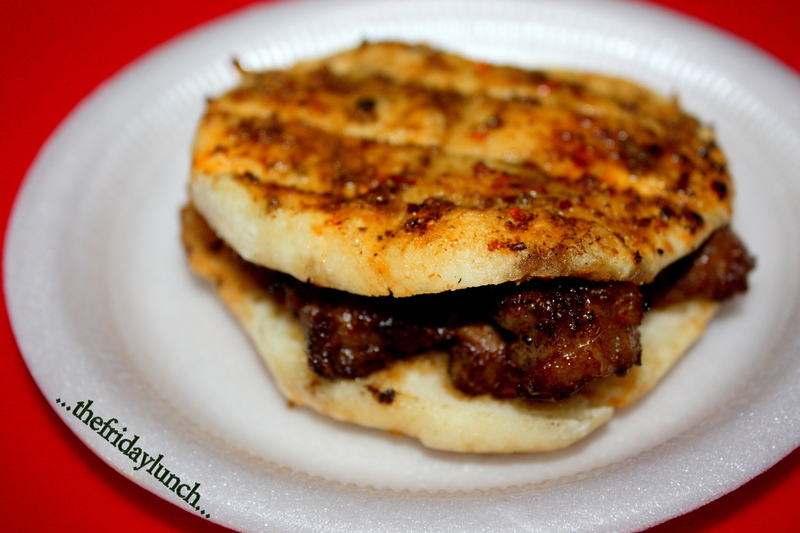 A couple of the lamb chunks were a tad too fatty but, overall, a great sammich. Makes your fingers taste great!! Right next to Want Want is one of Crystal Mall’s newest additions…Chao Shou Wang. They replaced the rather mediocre JB Malaysian. 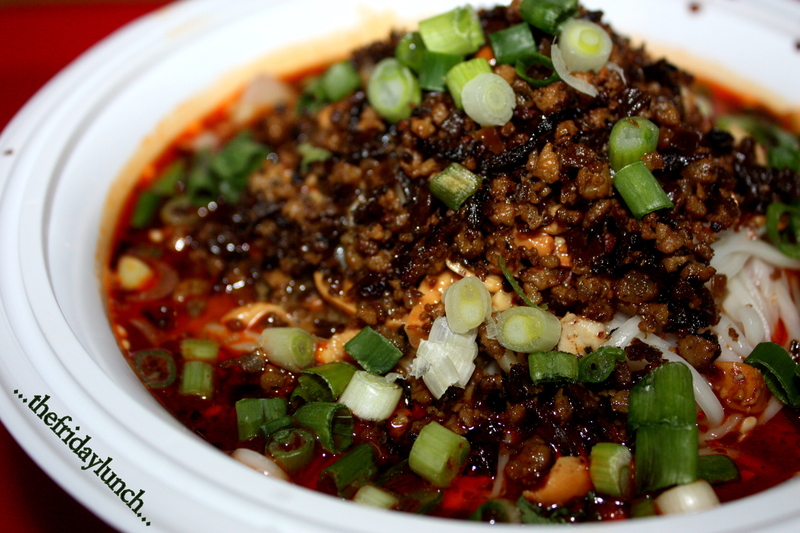 Chao Shou Wang offers up a variety of very spicy Sichuanese fare. Upon noticing that they had Dan Dan Noodles on the menu, I made that my first pick. This is one of the better Dan Dan Noodles I’ve come across. When they asked, “How spicy?”, I, as usual, said “Very!”. They all chuckled a bit amongst themselves and I got a wee bit nervous. Uh oh. Not to fear, too much. About ten minutes later, I was presented with a plentiful bowl of exceptional noodles. 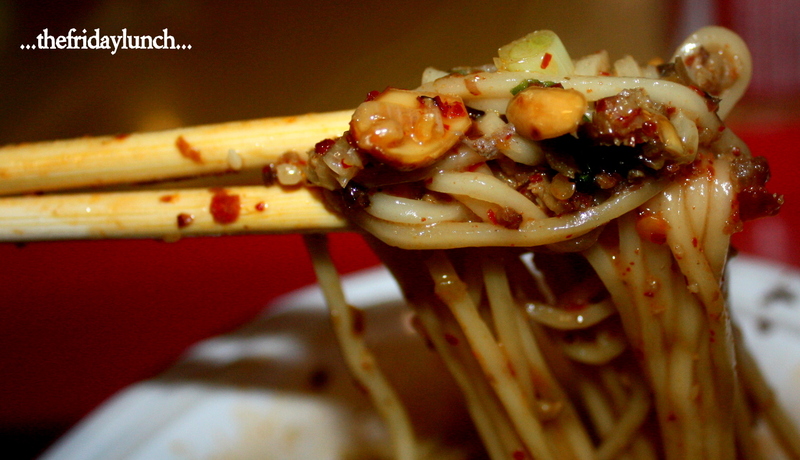 The noodles themselves, perfect…good and chewy. The broth was rich, deep and loaded, I mean LOADED with chili oil…great stuff. In addition to the chili are a large whack of Sichuan Peppercorns. This added the tingly, mouth-numbing element requisite to great Dan Dan Noodles. Mix in lots of peanuts, minced pork and scallion and you’ve got yourself a top-notch bowl. 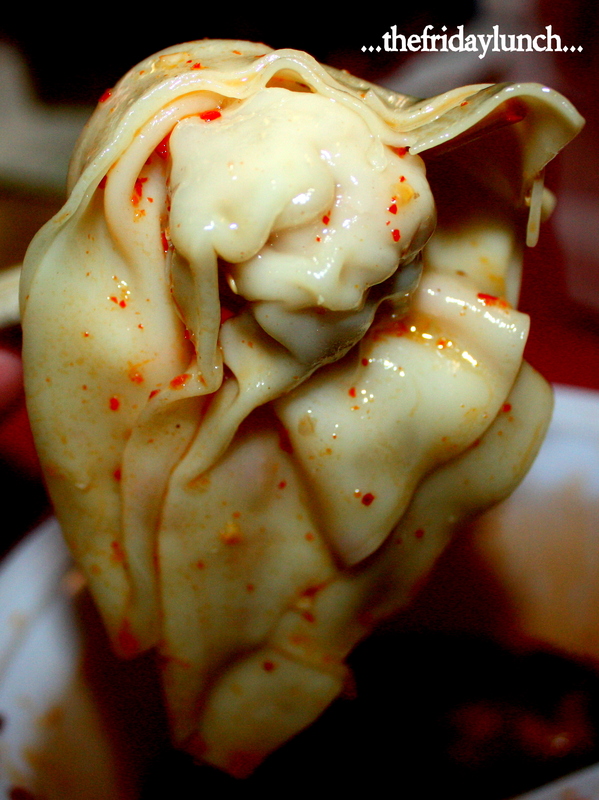 Last week, whilst writing about Legendary Noodle, we had their Chao Shou Dumplings. 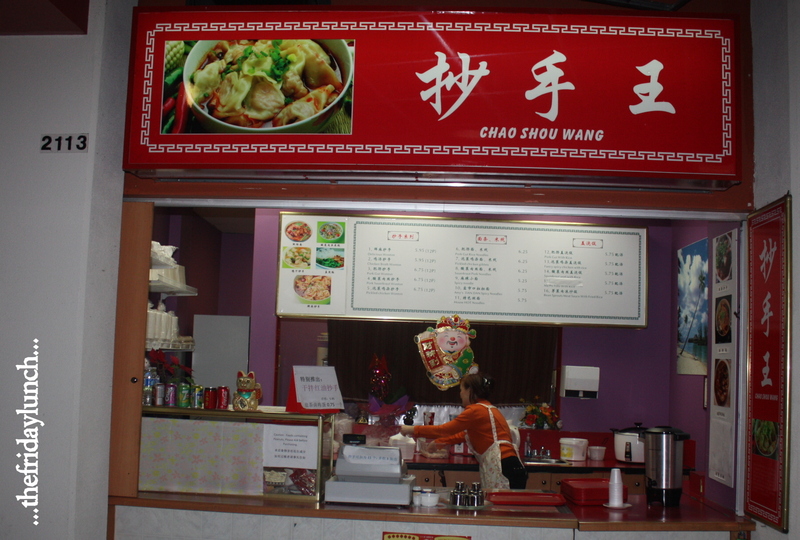 I remember seeing the words “Chao Shou” somewhere before our trip there. Where’d I see that? Oh, yeah! Right here at Crystal Mall! 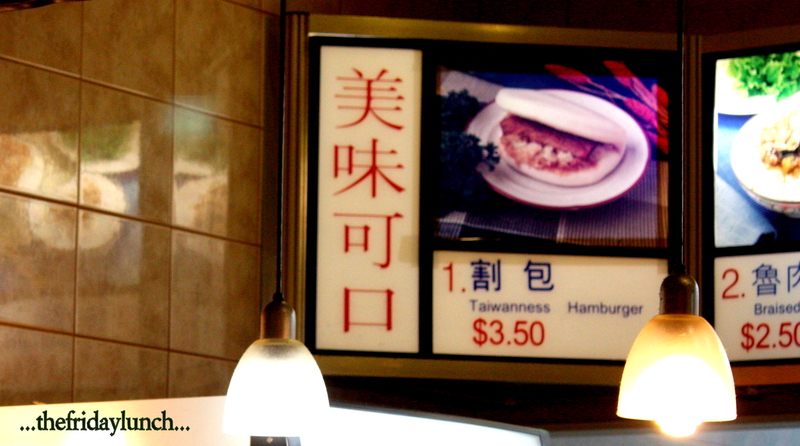 On the menu board they’re listed simply as Delicious Wonton…one of those things lost in translation. Again, while placing my order, I told them “spicy”. Again, the chuckles. Another “uh oh”. This time it was warranted. This is one fiery bowl. After one sip, wait awhile, let the taste buds recover, try again. Not too sure if I can manage this. This is an overwhelming amount of heat…damn tasty but incendiary. 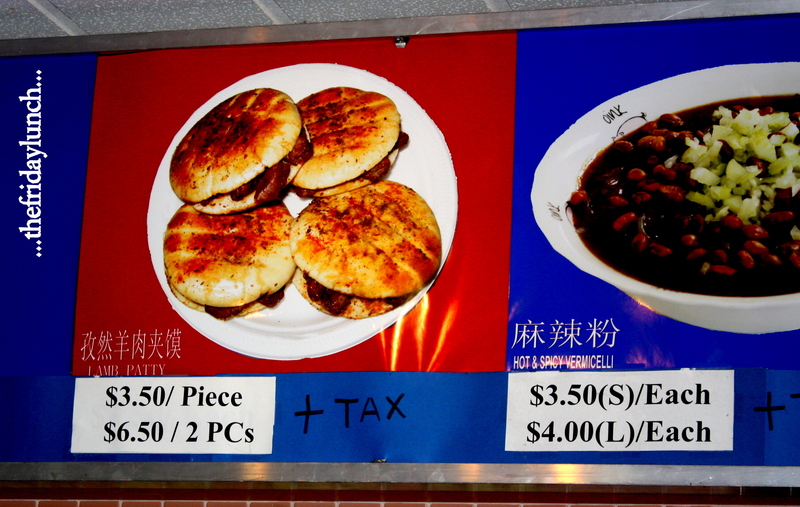 The dumplings are big and floppy containing a ground pork filling…not much else. Another great bowl, exploding with massive amounts of heat and big hits of garlic. Next time I’ll tone it down, just a little. There’s so much to discover at Crystal Mall’s food court. Good, honest food at reasonable prices. With some timely tips and several return visits, you’ll find the good stuff too. This entry was posted on April 10, 2011 by Karl. It was filed under Burnaby, Chinese, Crystal Mall, Dan Dan Noodles, Dumplings, Food court, Gua Bao, Lamb, Noodles, Sichuan, Snacks, Soup, Taiwanese and was tagged with Burnaby, chinese, Dumplings, Food court.